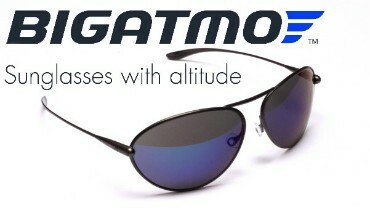 Win a Pair of Bigatmo Sunglasses! AeroExpo UK 2015 for your chance to win a pair of high performance sunglasses. A team of experts will be on hand at the Bigatmo stand to help you choose your ideal pair. The full collection will be on display so see the difference yourself, and hear more on why Bigatmo claim to have created the best sunglass product for pilots. Take advantage of the special SHOW OFFER too. Enjoy 15% off every pair purchased. Please visit stand number A2 in Hall A to choose your ideal pair, to enter the prize draw and take advantage of the show prices. 13:30pm on Saturday 30th May 2015. The winner will be announced at the fashion show on Saturday and can choose any pair of non-prescription sunglasses. Bigatmo is a British company, founded by an airline pilot on a mission to create the perfect pair of sunglasses for aviators. Ultra lightweight, comfortable frames sit well under a headset and advanced high definition lens technology enhances true colour perception, sharpness and clarity. The collection includes a wide mix of lens shapes, types and frame finishes, in both prescription and non-prescription. Designed and tested by pilots in a variety of demanding flight-deck environments, Bigatmo sunglasses are trusted by pilots performing at all levels across the globe. Prices start from £169 per pair.